The art of brush painting and the art of Japanese calligraphy means far more than simply putting brush to paper. Just as a martial artist trains with the sword to unify the mind, body, and spirit, so the brush is used to become fully aware and embodied in the moment of self-expression. Join us for a fun and relaxing exploration of brush painting and calligraphy techniques, and see why many martial artists, O Sensei included, considered the brush a vital part of their training and their well-being. Beginners welcome, ages 12 and up. 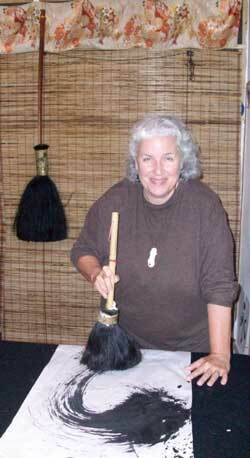 Frederica Marshall, Master Brush Painter, lived in Japan for 28 years where she studied Sumi-e (Asian Brush Painting) for 10 years with Grace Yen. Her works of art are included in private collections in Australia, Europe, Japan and the U.S. For nine years Frederica was an Artist in Residence in the Sarasota County Arts Council program “Artists in the Schools”.